The Veronica Travel Candle is the essential treat for the senses when you're traveling. Recreates the comfort of home and adds warmth and relaxation to any room. The Veronica Malibu Travel Candle is made with a proprietary organic soy blend and lead-free cotton wicks. They are an exotic blend of Italian Bergamot, Sheer Jasmine, Wild Orchid, Herbal Tea and White Musk. The traditional technique of making the Veronica Malibu Candle has been used in France for hundreds of years and allows them to burn slowly and neatly. Approximate burn time: 45 hours. 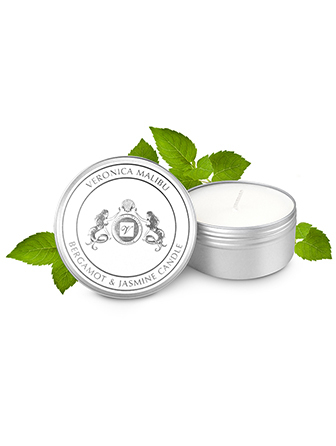 The Veronica Malibu Candles are animal friendly and environmentally kind. Your candle will last long and burn cleaner if you trim the candle wick to 1/4 inch. Light your candle and let it burn for 2 to 3 hours. Extinguish the flame with a candle snuffer and allow the candle wick to cool. Cut the wick back down to a length of 1/4 inch about the wax. Relight the candle and burn it for another 2 to 3 hours and repeat the process of extinguishing the flame and trimming the wick.